It so happened that I'm currently working on scaling some Python app. Specifically, now I'm trying to figure out the best way to scale SSH connections - when one server has to connect to thousands (or even tens of thousands) of remote machines in a short period of time (say, several minutes). How would you write an application that does that in a scalable way? The first blog post was exploring a solution based on threads, while the second blog post was exploring an architecture around asyncio. In the two first articles, we wrote programs that could handle this problem by using multiple threads or asyncio – or both. While this worked pretty well, this had some limitations, such as only using one computer. So this time, we're going to take a different approach and use multiple computers! As we've already seen, writing a Python application that connects to a host by ssh can be done using Paramiko or asyncssh as we've seen previously. Here again, that will not be the focus of this blog post since it is pretty straightforward to do. As a reminder, running this program alone and pinging serially 255 IP addresses takes more than 10 minutes. Let's try to make it faster by running it in parallel. Remember: if pinging 255 hosts takes 10 minutes, pinging the whole Internet is going to take forever – around five years at this rate. With our ping experiment, we already divided our mission (e.g. "who's alive on the Internet") into very small tasks ("ping"). If we want to ping 4 billion hosts, we need to run those tasks in parallel. But one computer is not going to be enough: we need to distribute those tasks to different hosts, so we can use some massive parallelism to go even faster! Use a queue. That works well for jobs that are not determined in advance, such as user-submitted tasks or that are going to be executed only once. Use a distribution algorithm. That works only for tasks are determined in advance, and that are scheduled regularly, such as polling. We are going to pick the second option here, as those ping tasks (or polling in the original problem) should regularly be run. That approach will allow us to spread the jobs onto several processes whose can be even spread onto several nodes over a network. We also won't have to "maintain" the queue (e.g. make it work and monitor it) so that's also a bonus point. 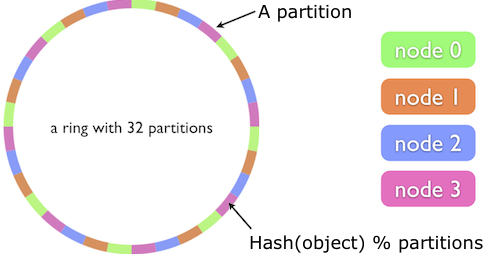 The algorithm we're going to use to distribute this task is based on a consistent hashring. Here's how it works in short. Picture a circular ring. We map objects onto this ring. The ring is then split into partitions. Those partitions are distributed among all the workers. The workers take care of jobs that are in the partitions they are responsible for. In the case where a new node joins the ring, it is inserted between 2 nodes and take a bit of their workload. In the case where a node leaves the ring, the partitions it was taking care of are reassigned to its adjacent nodes. If you want more details, it exists plenty of explanations about how this algorithm work. Feel free to look online! However, to make this work, we need to know which nodes are alive or dead. This is another problem to solve, and the best way to tackle it is to use a coordination mechanism. There are plenty of those, from Apache ZooKeeper to etcd. Without going too much into details, those pieces of software provide a network service where every node can connect to and can manage its state. If a client gets disconnected or crashes, it's then easy to consider it as removed. That enables the application to get the full list of nodes, and split the ring accordingly. There's no need to have any shared state between the nodes other than who's alive and running. To get a list of nodes that are available to help us pinging the Internet, we need a service that provides this and a library to interact with it. Since the use case is pretty simple and I don't know which backends you like the most, we're going to use the Tooz library. Tooz provides a coordination mechanism on top of a large variety of backends: ZooKeeper or etcd, as suggested earlier, but also Redis or memcached for those who want to live more dangerously. Indeed, while ZooKeeper or etcd can be set up in a synchronized cluster, memcached, on the other hand, is a SPOF. For the sake of the exercise, we're going to use a single instance of etcd here. Thanks to Tooz, switching to another backend would be a one-line change anyway. Tooz provides a tooz.coordination.Coordinator object that represents the connection to the coordination subsystem. It then exposes an API based on groups and members. A member is a node connected through a Coordinator instance. A group is a place that members can join or leave. # Start it (initiate connection). Don't forget to run etcd on your machine before running this program. Running a first instance of this program will print set(['client1']) every second. As soon as you run a second instance of this program, they both start to print set(['client1', 'client2']). If you shut down one of the clients, they will print the member list with only one member of it. join_group method, we're gonna use the join_partitioned_group method. Here we got a third client in the mix, excellent! If we stop one of the clients, the rebalancing is done automatically. The distribution algorithm is not made to be perfectly even. If you have a vast number of objects, it might seem pretty even statistically, but if you are trying to distribute two objects on two nodes, it's probable one node will handle the two objects and the other one none. The distribution is not done in real time, meaning there's a small chance that an object might be owned by two nodes at the same time. This is not a problem in a scenario such as this one, since pinging a host twice is not going to be a big deal, but if your job needed to be unique and executed once and only once, this might not be an adequate method of distribution. Rather use a queue which has the proper characteristics. Now that we have our hashring ready to distribute our job, we can implement our final program! """Returns a unique byte identifier so Tooz can distribute this object.""" On the other hand, client2 is skipping nodes that are belonging to client1. If you want to scale further our application, we can start new clients on other nodes on the network and expand our pinging system! This ping job does not use a lot of CPU time or I/O bandwidth, neither would the original ssh case by Alon. However, if that would be the case, this method would be even more efficient as the scalability of the resources would be a key. that you can implement using Python. There are a few other options available on top of this mechanism such as defining different weights for different nodes or using replicas to achieve high-availability scenario. 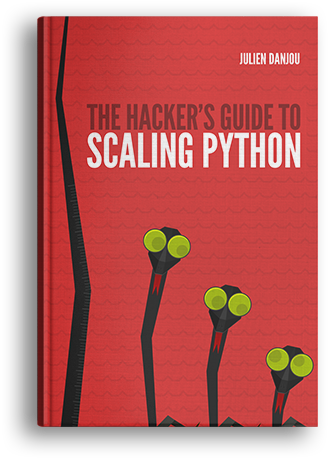 I've covered those in my book Scaling Python, if you're interested in learning more!